Bishop Hermann L. Sticher led United Methodists in West Germany just before the Berlin Wall fell. 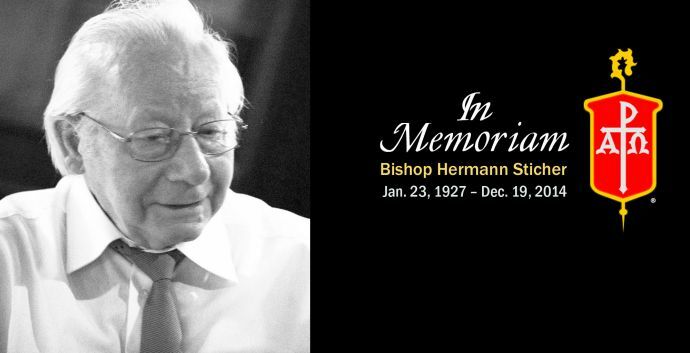 Retired Bishop Hermann L. Sticher led United Methodists in Germany as western European culture was growing ever more secular. But he never lost faith in the church’s capacity to make more Christian disciples, say church leaders. Sticher died Dec. 19 of cancer, his family announced. A commemoration service is planned in his honor on Jan. 8 at Reutlingen United Methodist Church of the Redeemer in Germany. From 1977 to 1989, Sticher was bishop of the German Central Conference in what was then the Federal Republic of Germany (West Germany) and West Berlin. His area included the German Northwest, the German South, and the German Southwest conferences. He retired just months before the fall of the Berlin Wall on Nov. 9, 1989. But as bishop, he strengthened relationships with United Methodists in the German Democratic Republic (East Germany). Retired Bishop Ruediger Minor, who served as bishop in East Germany from 1989 to 1992, recalled a morning devotion Sticher led during the 1980 General Conference. Minor also credited Sticher with introducing him to the service of bishop. Sticher provided “advice and rich experience” that helped the church remain focused and effective in service and witness, Minor said. During Sticher’s tenure, he frequently prodded German United Methodists to become “a missionary church” that reached new people in an environment where Christianity was no longer central. “We are grateful to God for his life's testimony and his ministry,” said Bishop Rosemarie Wenner, who currently leads the United Methodists in reunified Germany. Sticher was born in 1927 in Tuebingen, in southern Germany, and came out of the Evangelical United Brethren tradition. In the immediate aftermath of World War II, he felt distant from the church. After leaving secondary school, he initially trained as an interpreter and worked for six years as an interpreter, translator and press officer at the U.S. Consulate General in Stuttgart. But eventually, he felt a call to full-time service and studied at Reutlingen Theological Seminary from 1954 to 1957. He ministered at several churches in southern Germany and served an eight-year term as district superintendent. He was pastor of a church in Ludwigsburg when he was elected bishop. He spent most of his retirement in Nuertingen-Raidwangen in southern Germany. But in 1993-94, he taught as a visiting professor at United Methodist-related Nebraska Wesleyan University in Lincoln, Nebraska, where he held the Mattingly Chair of Religion for Distinguished Persons. Sticher was active in many areas of the church, including central conference and ecumenical matters. As bishop, he also served on the board of what is now Discipleship Ministries, the former United Methodist Board of Discipleship. At the time, the Rev. Eddie Fox was head of the agency's evangelism division. "I'm telling you, when you were in a meeting and he spoke up, people listened," Fox said. "People saw him as a very faithful person and person of great integrity and leadership." Later, Fox worked with Sticher when the bishop was a leader at the World Methodist Council, a worldwide association of Methodist and Wesleyan denominations. Sticher was the chair of the World Methodist Council's Conference in Singapore in 1991, which drew together thousands of people. Fox noted that the bishop was one of the first to receive the church association's highest honor, being named in 1999 a founding member of "The Honorable Order of Jerusalem of the World Methodist Council." Sticher had a commitment to mission, said Thomas Kemper, the top executive of the United Methodist Board of Global Ministries, the denomination’s mission agency. The bishop led the Association of Missions in Germany (EMW), a coalition of mission agencies, during the fight against apartheid in South Africa. Kemper, a native of Germany, said Sticher also played an important role in shaping his ministry. “It was under his leadership that my wife Barbara and I were called and commissioned by the church for missionary service in Brazil in the 1980s,” Kemper said. Sticher is survived by his wife, Lisa Sticher, and three sons, Thomas, Matthias, and Tilmann. Ruof is a communicator with the United Methodist Church in Germany. Heather Hahn is a UMNS multimedia reporter. Contact Hahn at newsdesk@umcom.org or 615-742-5470.